Woman with a pocket watch in Fall River, Mass. Since talking to my costumer friend recently about how men wore jewelry, particularly pocket watches and similar fob-like items, in the late 1800s (she’s currently costuming a show set in the late 1880s), such jewelry has really been standing out as I’ve looked at my photos. Here we have three men, all wearing them attached to their vests, which seems to be more common than attaching them to their jacket lapels. 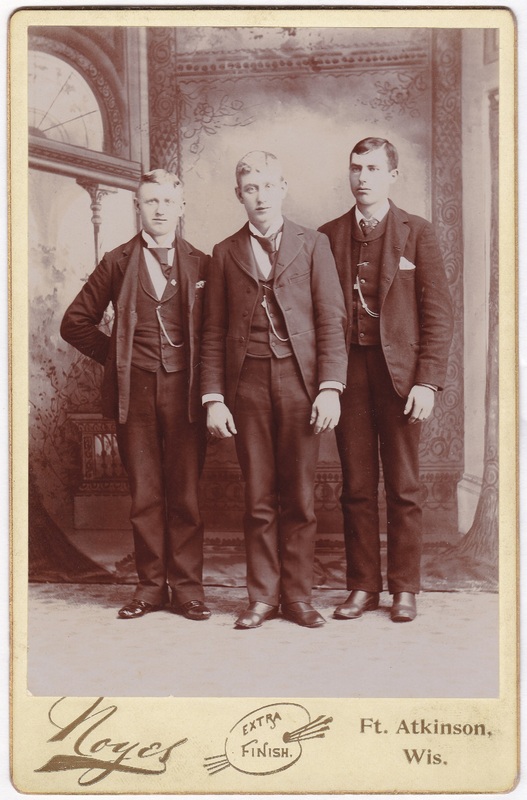 Additionally, the man on the left has some other sort of pin on his vest, the two on the right seem to have tie pins, and the one in the middle seems to have a ring on his right hand. Also interesting (to me) is the way the two men on the left have their ties placed to the side, rather than hanging straight down the center. To our modern eyes, this looks like a mistake, like the tie is accidentally askew, but I’ve seen this look often enough now (such as here and here) that I’m realizing it was a deliberate choice. By the way, this photo was purchased with several other photos including ones from Fort Atkinson, and even ones from this same photographer, leading me, as always, to wonder how, and if, they are related. The only other one I’ve posted so far is this one, though I’ll post another tomorrow. To my eyes, the man on the right here bears a slight resemblance to the boy in the other photo. Relatives, perhaps? Or just coincidence? Oh, man–I just straightened an actor’s tie the other day; maybe I should have left it! Ha! Well, as you’ve said before, it can be challenging to find the right balance when a look that is historically accurate “reads” wrong to a modern audience. The guy in the middle looks so fair skinned, that he must sear in the sun! Yes, indeed! I suspect the photo makes him look a bit washed out, but he definitely looks pale. Yes, I love the body language in old photos. Glad you like it.